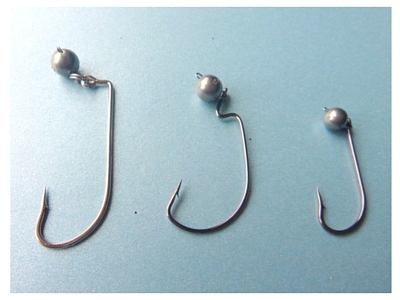 The hook types that can be used include a straight or long shank hook, wide gape worm hook, offset shank and so on. Double hooks can also be used. Where lure length is over 100mm, stinger hooks can also be added to the main hook. 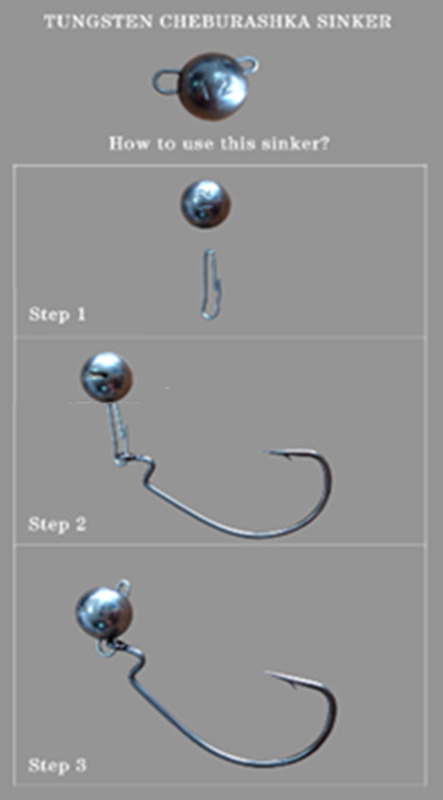 A single hook is generally the better method though, as unhooking is easier. 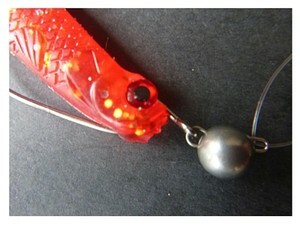 In some instances rigs may require the use of a split ring if the hook has a vertical eye (see images provided). This is not necessary for flat eye hooks. Once the right combination of lure, hook type and hook size is determined simply select the desired weight of jig head and clip it on. As currents or other factors change, eg wind speed affecting casting, the rig can be tuned by simply changing the weight. Swimerz Clip-On 'Cheburashka' Jig Heads are made from 97% pure tungsten material. At just under twice the density of lead tungsten is on average 30% smaller than its lead counterpart. So, instead of a huge chunk of lead being presented along with your bait, the tungsten counterpart is smaller, will maintain its shape for longer, and hang-ups will occur far less with a tungsten jig head or sinker than with a similar lead product because of its smaller size. Tungsten alloy worm weights also create more noise than softer lead weights, assisting in attracting the attention of fish. Where this type of rig differs from traditional jig heads is not just in the flexibility of hook size/hook type/weight combinations that can be used, but most importantly, in the way the rig acts in the water. Instead of a rigid lure/rig setup where the weight is fixed to a hook, as in standard jig heads commonly in use in Australia, the ‘clip on’ enables the lure to swing freely behind the jig head. This enables a more natural presentation, through more movement, and is proven to be very effective. Instead of using loop connections to the head of a standard jig head, to try and get additional lure action, these jig heads enable a direct knot to be tied to the Cheb while still providing unrestricted movement of the lure and giving greater resistance to that fish busting off. Swimerz Clip-On Jig Heads are available in a range of weights and suit any finesse fishing type, whether it targeting finicky trout and other fresh water species to estuary species like Bream with the smaller sizes, while the larger sizes can be used for a broad range of species in estuaries etc. The images provided feature the Swimerz Offset Shank Worm Hook with split ring, Swimerz Wide Gape Worm Hook, and Swimerz Straight Shank (Worm) Hook, but any hook can be used, as previously stated.